This is a Cooking Light recipe and is such a unique take on mac and cheese. What makes it light is that you are using mashed sweet potatoes in place of some of the cheese. The recipe also includes some chopped chipotle chiles which gives it a sort of smokey flavoring. You then top it off with some crispy bits of Mexican chorizo which gives it another level of flavor and makes a nice crispy topping. I really had no idea of what to expect with this recipe, but I ended up really loving it! 2. Pierce potatoes several times with a fork; place on a foil-lined baking sheet. Bake at 425° for 1 hour or until tender. Cool slightly; peel and mash in a large bowl. Stir in milk and next 4 ingredients (through cheese). 3. Cook pasta according to package directions, omitting salt and fat; drain. Add pasta to sweet potato mixture; set aside. 5. Heat a large ovenproof skillet over medium heat. Add oil; swirl to coat. Add chorizo to pan; cook 4 minutes or until browned, stirring to crumble. Place chorizo in a small bowl. Wipe pan clean. Spoon sweet potato mixture into pan; sprinkle evenly with chorizo. Broil 2 minutes or until lightly browned and crisp. Sprinkle with onions and cilantro. Sounds great! 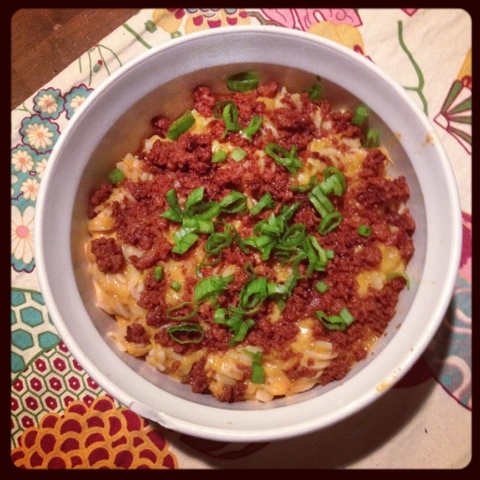 I love sweet potatoes and mac n' cheese -- even better to combine them!